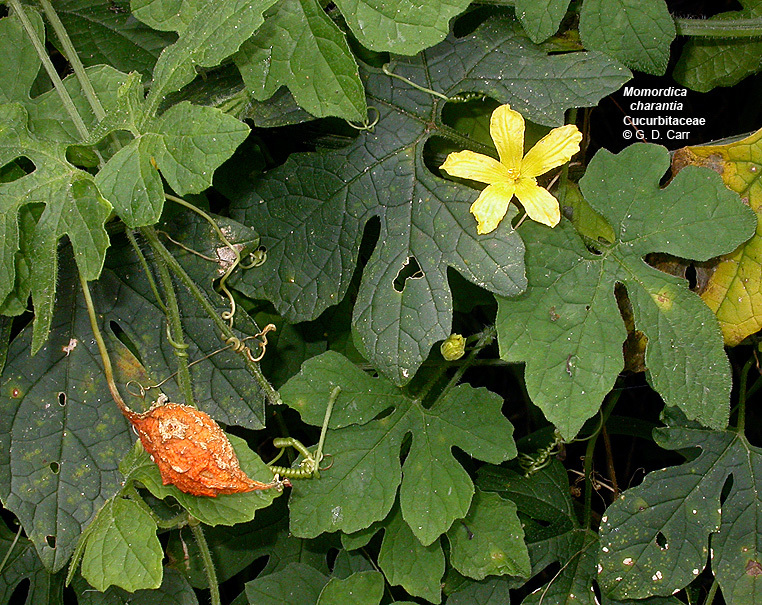 The Cucurbitaceae are mostly prostrate or climbing herbaceous annuals comprising about 90 genera and 700 species that are further characterized by commonly having 5-angled stems and coiled tendrils. 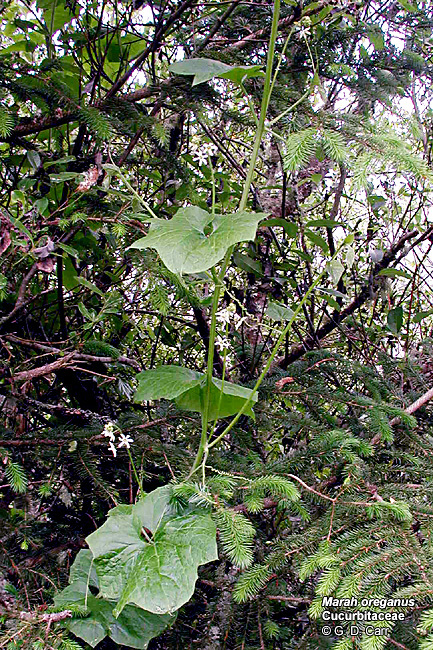 The leaves are alternate and usually palmately 5-lobed or divided; stipules are absent. 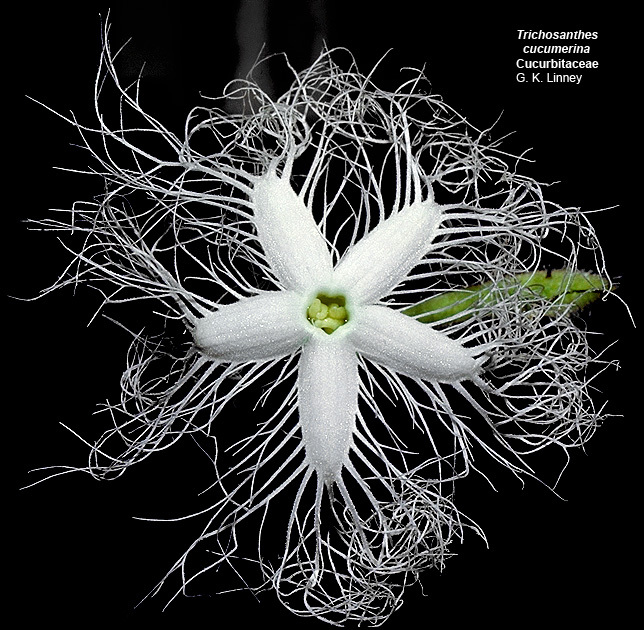 The flowers are actinomorphic and nearly always unisexual. 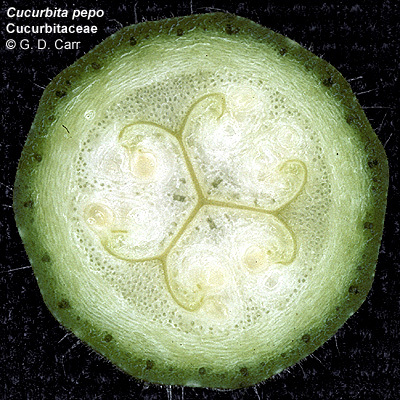 The perianth has a short to prolonged epigynous zone that bears a calyx of 3-6 segments or lobes and 3-6 petals or more frequently a 3-6-lobed sympetalous corolla. The androecium is highly variable, consisting of basically 5 distinct to completely connate stamens that frequently are twisted, folded or reduced in number. The gynoecium consists of a single compound pistil of 2-5 carpels, generally with one style and as many style branches or major stigma lobes as carpels, and an inferior ovary with one locule and usually numerous ovules on 2-5 parietal placentae or 3 locules with numerous ovules on axile placentae. The fruit is a type of berry called a pepo. 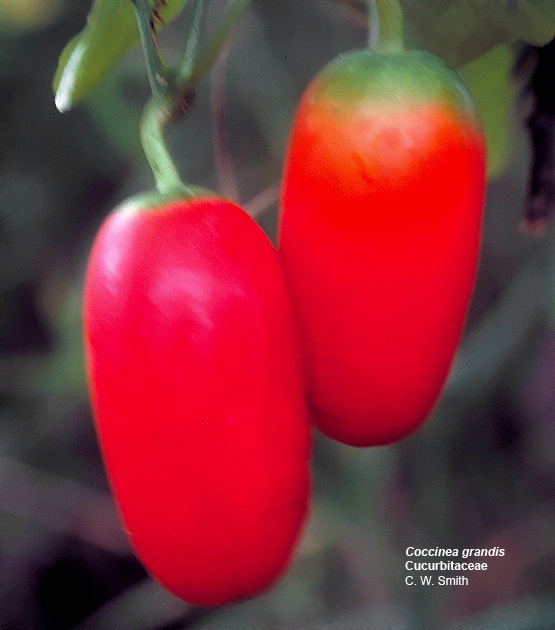 Coccinea grandis, ivy gourd, scarlet-fruited gourd. Cucumis dipsaceus, hedgehog. 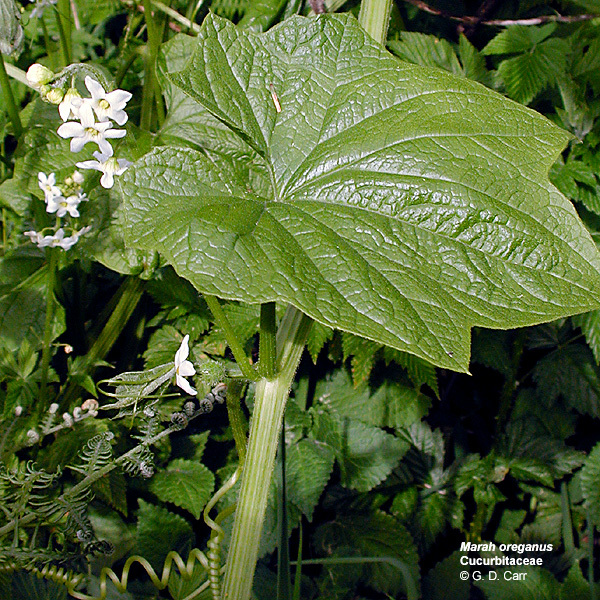 This species shows the herbaceous, vining habit typical of the family. In sectional view the fruit reveals the parietal placentation that is most common in the family. In some cases, the placentas intrude to the central axis and fuse to produce multiple locules and axile placentation. Cucurbita pepo, zucchini. 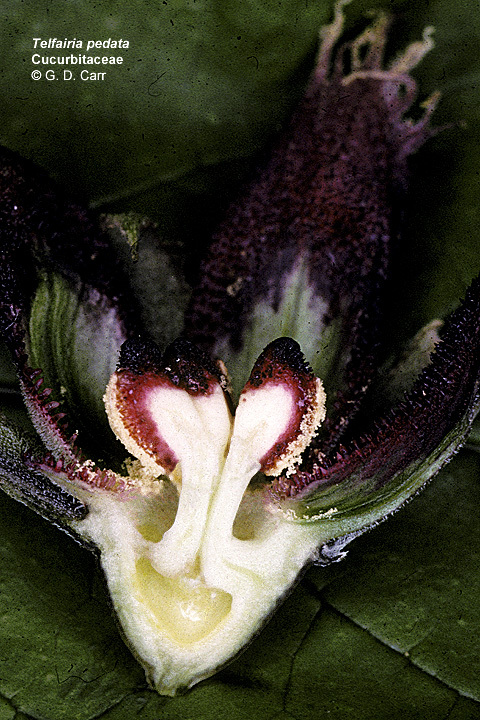 The first photo shows male and female flowers; much of the calyx and tubular corolla have been cut away to reveal the sexual components. 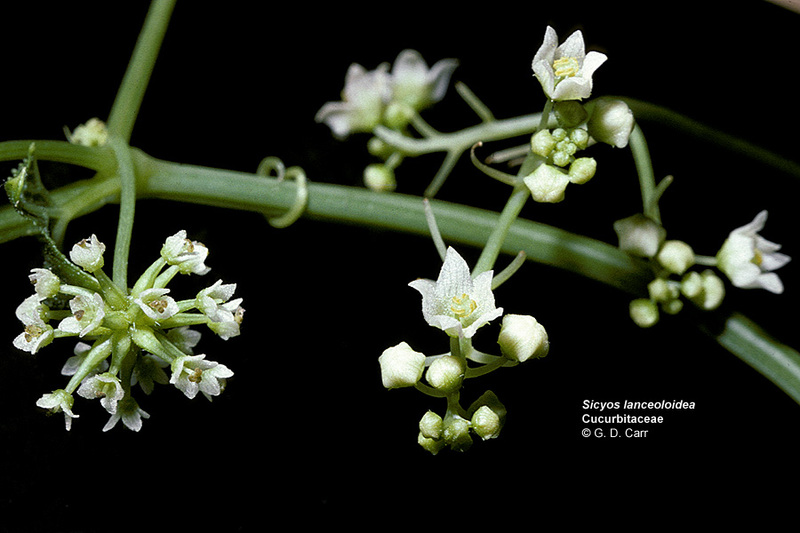 On the left is a male flower that shows the androecium with broad, variously connate filaments and connate and somewhat twisted anthers. 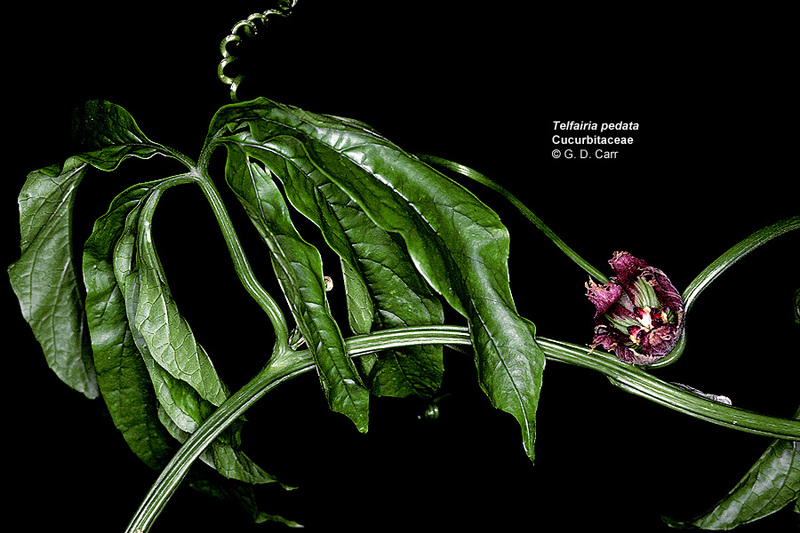 The flower on the right is female. The large, inferior ovary bears the perianth at its summit. Also visible is the 3-branched style and yellow stigmas. 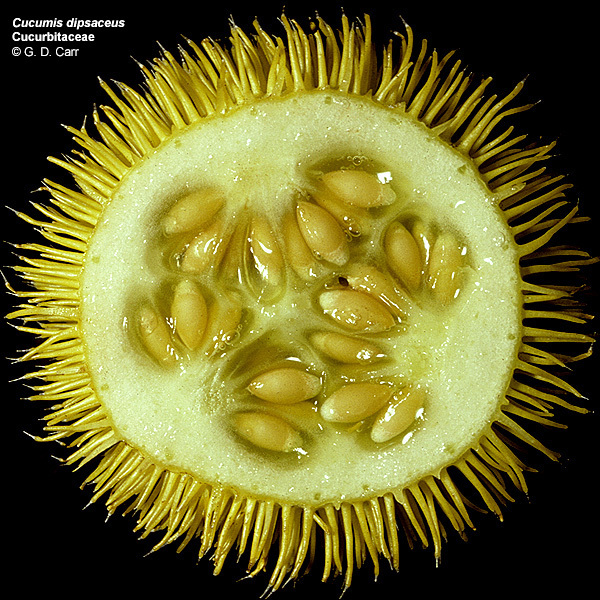 The second photo is a cross section of the fruit. 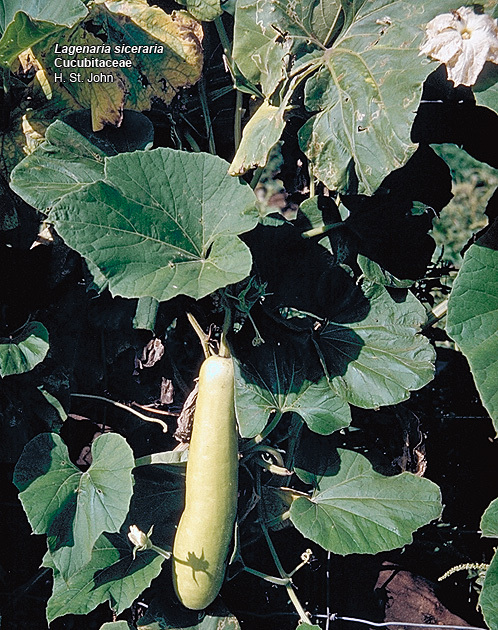 Lagenaria siceraria, bottle gourd, ipu. 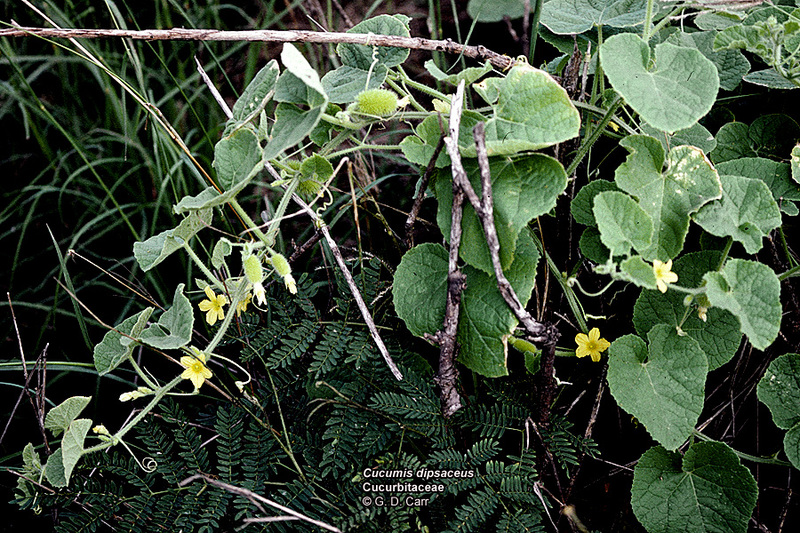 Marah oreganus, wild cucumber, vic. Newport, OR, 2002. 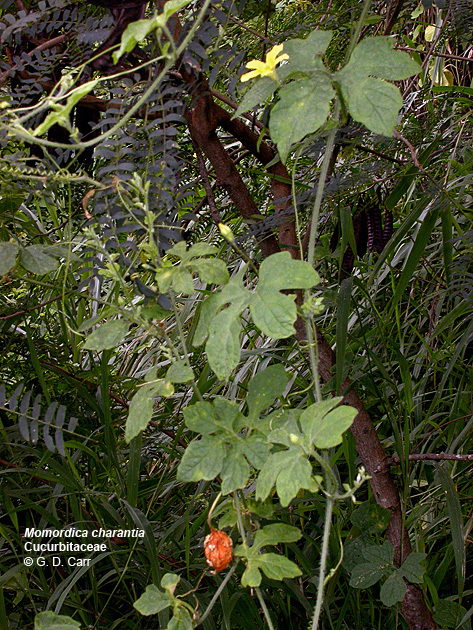 Momordica charantia, bitter melon, balsam pear. 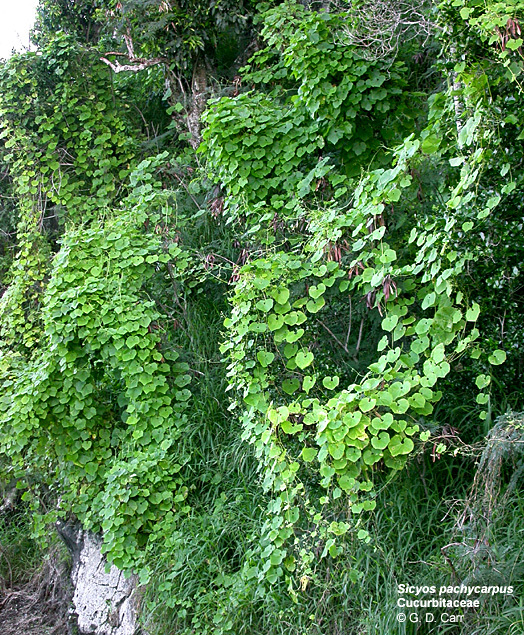 Kealia Trail, Oahu, 2005. Sicyos hispidus, a'nunu. Hawaiian endemic. 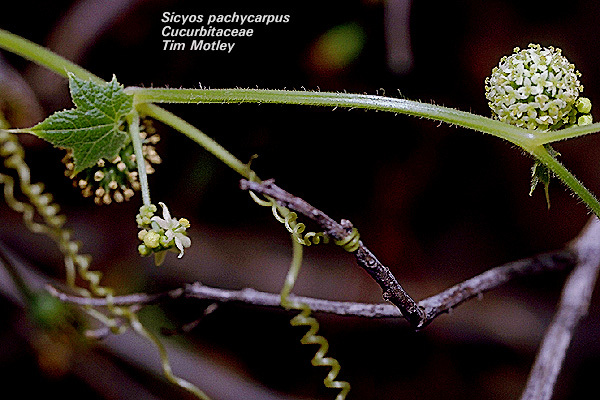 Sicyos pachycarpus, kupala. Hawaiian endemic. Sicyos sp., a'nunu. 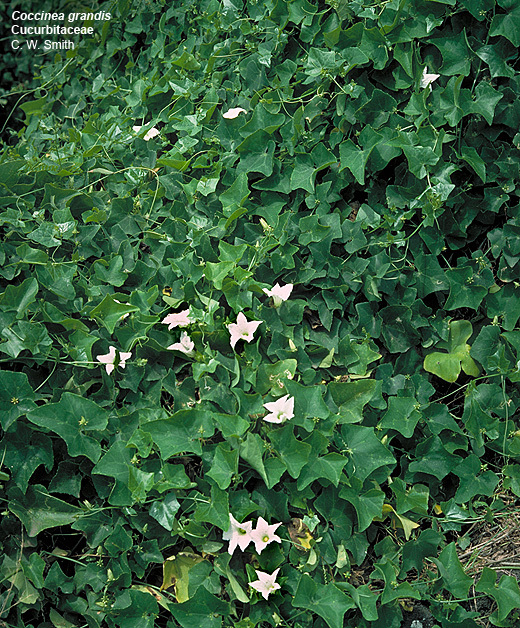 Several species of this genus are native to Hawaii. 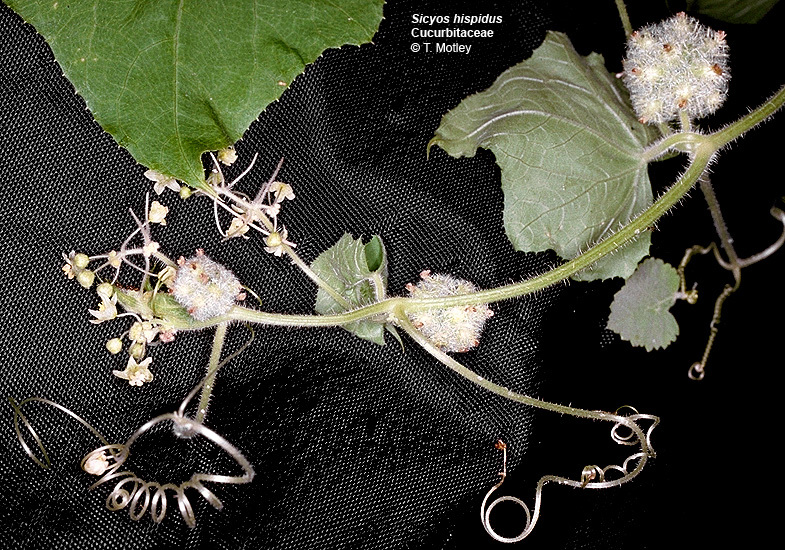 This photo shows a female inflorescence in the lower left. The tightly clustered inferior ovaries develop into a multiple fruit. Yellow stamens are visible in a couple of the open male flowers on the right.